There’s an old racer’s adage that contends the addition of power is helpful on the straights, but the subtraction of mass is helpful everywhere. By getting your car as light as possible, there is less weight to move through the corners, and even the brakes will perform more efficiently. 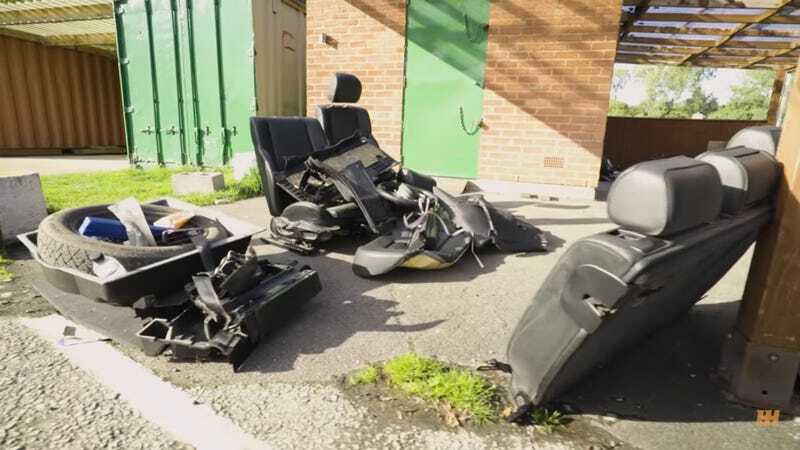 To put this theory into practice, the folks at CarThrottle removed about 300 pounds from the interior of their BMW 330D wagon to see how much quicker it would be around the short race track they use for testing. The goal for this project was to make the 330D match time with an E92 M3 around the same track, and they didn’t quite make that happen, but came within a couple tenths of a second. After fitting the car with a performance chip, upgraded suspension, brakes, and a lighter wheel with stickier tires, the car was close to perfect. Then, in the name of speed, they went and screwed it all up. Stripping a car’s interior is usually a terrible idea. Interior components make nice places to sit, and provide amenities that make driving relaxing and enjoyable. By taking all of the nice leather out of this BMW, they pretty much ruined it for the street. It’s a less comfortable place to be now, and without that sound dampening material, a much louder place, too. But, having stripped the interiors of a number of my cars, it’s too freakin’ cool to not do it. Sure, you can’t carry passengers anymore, but think of the added utility of a stripped wagon. Dropping 300 pounds of stuff from the curb weight of a car is not a simple task, but in this case it was a rewarding one. In back-to-back tests before and after the weight reduction, this BMW gained a 0.26 second advantage on a short and tight course. That’s a 6% quicker lap time. Most track fiends and autocrossers would pay thousands of dollars for a 6% quicker car.